Nokia's long-rumoured Android phone, believed to be dubbed Nokia X (codenamed Normandy) has been leaked again in live images, this time revealing design of the alleged device. 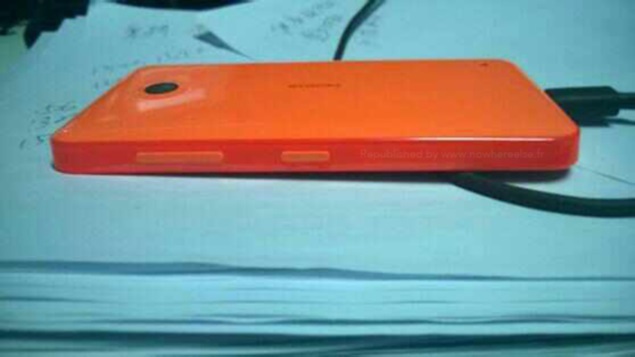 A French publication, No Where Else, has posted three images of the alleged Nokia X which purportedly show the device. One of the leaked images of the alleged Nokia X phone shows the front panel housing a Nokia logo on the top of the panel. Another leaked image shows the rear panel of the rumoured Nokia X, and appears to be made of plastic, similar to the material found on Asha devices, while the third leaked image shows the side panel housing a physical button for power and a volume rocker. The alleged Nokia X aka Nokia Normandy is expected to be introduced at the upcoming MWC 2014 event held in Barcelona, starting from 24 February. On Wednesday, a new leak via Browsermark 2 benchmark's database purportedly revealed the alleged Nokia X phone to comes with model number RM-980. Unfortunately, the listing did not reveal any details about the device, but includes an image that purportedly showed Nokia X wearing Nexus 5's wallpaper and home screen icons. However, the current image contradicted earlier reports that claimed that Nokia, following the lead of Amazon, has been working on a fully-tailored or forked version of Android, like the software on the online retail giant's Kindle Fire tablet range. The alleged Nokia X was recently listed at a Vietnamese online retailer that revealed most of the specifications, including a 4-inch TFT display with a resolution of 480x854 (FWVGA) pixels; a 1GHz dual-core Snapdragon 200 processor; 5-megapixel rear camera; microSD card support and Android 4.4 KitKat. Further, the listing seemingly confirmed that the rumoured Nokia X would come with dual-SIM support, while connectivity options include 3G, Wi-Fi, Bluetooth, GPRS, EDGE, AGPS and Micro-USB. Other specifications include 4GB of inbuilt storage and Adreno 302 GPU. Notably, the listing claimed that the alleged Nokia X supports Google services like Google Play store, Google Search, Google Now, Google Maps, Calendar and YouTube.